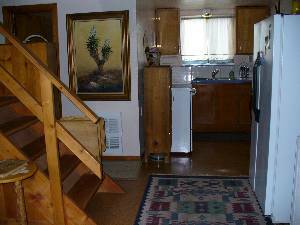 property into National Forest, along Oak Creek or box canyon. Pets o.k. 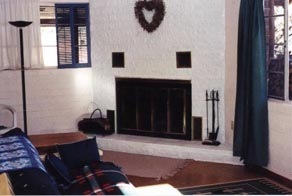 Sit by the fireplace enjoying the gorgeous redrock view, reading, listening to cd's and experiencing vortex energy and peace! Wireless hi-speed internet, satellite TV and free long distance phone. DVD library, VIEWS, HIKES, PEACE! My dogs and I spent a very enjoyable two weeks here. The view out the picture window was heaven and I never was tired of looking at it. The cabin itself was small but very adequate for a single adult accompanied by two large dogs but would be cramped for 6 adults, however, a family with children would find it very comfortable. Hiking trails are very close and the scenery is to die for. We walked to Crescent Moon Ranch several times while we were there and the dogs enjoyed swims in Oak Creek. My only complaint was that the internet connection stopped working after only two days but a vacation is really about getting away from all that anyway. A washer and dryer on the premise were definitely a plus and the property was clean and well maintained. I would highly recommend this rental property. Owner's Response: We list the cabin as sleeping six, but do not rent it as such unless it is a family with children. 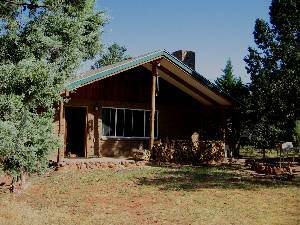 I am heartened that when internet is not available, we can take our focus to the natural environment, which is exactly why we maintained this cabin as a cabin retreat! (And there are instructions in the drawer below the router about who to call with internet problems if one needs that). My husband is a pastor and we were on Sabbatical. We were looking for an affordable place to stay while we visited Arizona. This cabin was the perfect choice! It is a fully equipped home in a wonderful setting. There are many places to hike within walking and driving distance. Even though there are homes in the same area we never heard the neighbors. It was a very peaceful week in a beautiful place! The owner, Marcia, was a pleasure to rent from. If we ever get another opportunity to go to the area, we definitely will stay here! Charming cottage with fabulous view. My family and I spent 8 delightful days at the cottage at the end of May. Everyone loved it. It is great for kids and pets. It is a cosy and comfortable place. The view is fantastic. The dining room faces Cathedral Rock. 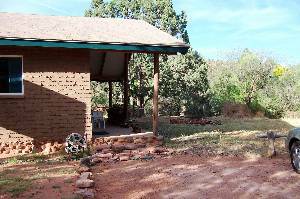 It is a quiet area minutes away from Red Rock State park. 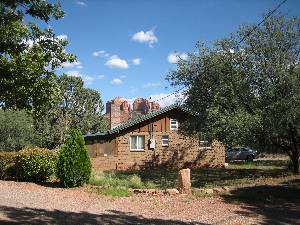 A wonderful place to rent in Sedona. We are planning on renting there again in the near future. The area has so much to offer, 8 days were not enough. Marcia, the owner, is a very nice lady to speak to and she was very helpful. Our family of four stayed at the cabin in the summer of '03 and had a wonderful time. The location was perfect for outdoor activities. 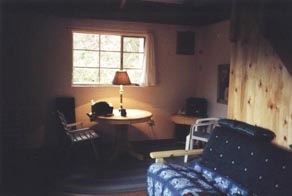 The cabin was clean with all amenities provided -- dishes, linens, a washer/dryer, books and board games. I've recommended it to several people since then. If you're looking for super-luxury (at a super-luxury price), you can stay at the creekside cabins at the Auberge de Sedona. On the other hand, if you want a relaxed setting with the ability to cook for yourself, without being *too* rustic, this is a great choice. In response to Susan: I always admit that this is a true cabin, not a resort or house with central heating, because most people seeking a cabin want the experience of a retreat in a naturalistic setting. We offer all of that and more, as we allow pets as well. 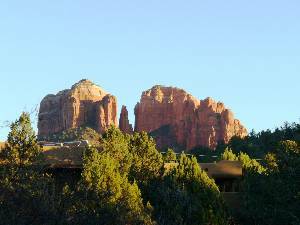 We just had thermopane windows installed, and the view from the living/dining area picture window is divine, despite the presence of one Sedona home not in the view corridor of Cathedral Rock. his cabin is mis-represented. It has no heat-just a space heater and it is a cold hoouse. The loft is tiny with an uncomfortable bed on the floor-there is not even head room. It was dirty upon arrival-used soap in bathroom. There is no GREAT room-just one big ugly room and "newly renovated" is a SLIGHT exageration-it must have been really bad before. View obstructed by another house. We stayed for nearly a week. The cabin was small but comfortable. The view was unbelievably gorgeous. The owners tried in many ways through notes and instructions to make our visit pleasant and gave advice on places to go and easy ways to get there. We were also given lots of info on how to get help if needed. All in all it was a very pleasant experience and I would stay there again if the opportunity arose. Very centrally located for seeing Arizona. Call or e-mail for rates. Housekeeping $65, pets $25. Rates for family of 4. Additional adults $10/ea per night or $50/ea per week. Deposit: $125 refundable security deposit w/lease. Pet fee $25 each. Required Stay: 2 nights minimum.